My mind is filled with stories about life. My heart is most strongly affected by the stories of those I love, and what I love. My work is in the care of others: preschool age children, those with special needs, those learning a musical instrument, those starting a garden, those who have dementia, those who want to join a choir at church. These are the aspects that make up my life. I love to sing, and to create art, but what I love more is to invite others into these experiences, to poise people for success that might otherwise think they can’t sing, or create art. Of course, they can. I make a home for this to happen, with enthusiasm and organization that allows people to join me, to participate, to thrive. Your mind is full of many stories that make up your life. Your heart is most affected by those you love, and what you love. 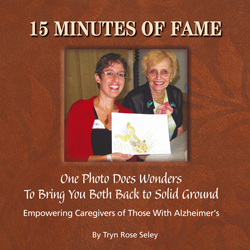 As a caregiver of someone with Alzheimer’s, you can draw on those stories for fun and profit! Telling the stories that bring laughter and poignancy for you will bring your good feelings to the table, and you may see that it brings laughter and poignant memories for your family member or friend. Even if you can’t see a response, you’ve had your own. Bringing life to the caregiver’s heart brings life to everyone.